Robots are used as a medium to express ideas through interactive art. A way to automate expression maybe. "Thomas Edwards is a technological artist living near Washington, DC. His work seeks to explore the interface between people and electronic machines, often by encouraging true interaction between them." "Sycophant explores the relationship between viewers and a human-like robot. The human head is mounted on a motorized base which moves along a track. 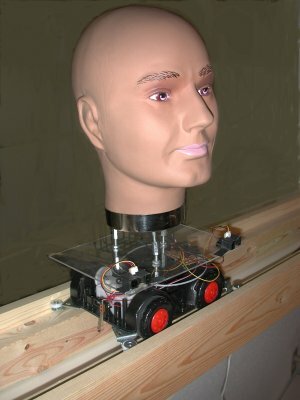 As a viewer walks by, the head follows on the track, while plying him or her with a cornucopia of compliments such as "I really like your hair" and "You look really hot!" 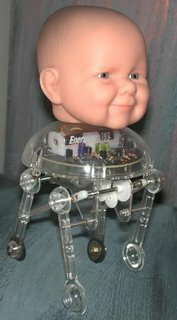 Robobaby - "Combining the best of natural genetics and robotic technology."